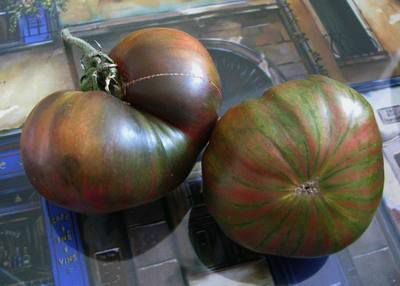 Tomatoville® Gardening Forums Index > We're Here For The Tomatoes!™ > Our Legacy of Yesteryear Varieties > Dark Copia Heart? Yes, I recognize it and Copia itself is not a legacy variety, so anything derived from it isn't either. Copia has been used in the breeding projects of several folks, which is true of this one. Hopefully the above links should tell you all you want to know about it. Oh Gosh now what to do. I also have 5 sturdy Copia ready for the ground. It is pretty, but not an heirloom. I hope you get plenty of good tasting tomatoes from them. I grew Copia one year and it was the biggest plant around and only had one tomato on it. It was beautiful but the worst tasting tomato I have ever had. Even worse than store bought because the latter has no taste at all. Craig (NCtomatoman) here told me a few years ago that at their tomato gathering it was voted the wost tomato there. I'm telling you this because you might try maybe two plants and save room for something else and give the other three to your worst enemy. And I agree with Worth. Some have used it in their breeding projects for the color, but NOT the taste. Oh Gosh now what to do. I also have 5 sturdy Copia ready for the ground . . .
Tootaloo, I hope you read the links that Carolyn posted . . . clearly there are people who really liked the flavor of Copia/Dark Copia Heart, so don't give up hope of favorable results from your 5 sturdy plants until you see how they do for you . . . and don't forget to bag a few blossoms . . . could be that everyone, including the gloom-birds, will be following you around, chirping for seed. I've no experience with this tomato at all . . . but it does look like one where there might be some difficulty determining the appropriate harvest time. There are other tomatoes where one sees widely different love/hate reports where difficulty determining best harvest time/ripeness seems a likely explanation for the different taste reports -- especially when that difficulty interacts with the fact that some people like "almost ripe" tomatoes and others prefer tomatoes so ripe they are almost over-ripe and starting downhill. So hopefully your initial taste results will be great, but if they aren't favorable, it might be worth making a point to try some at a different ripeness level. Just a thought. A variety that is stable for taste, color, stripes and size, we are trying to capture the heart form to stay PUT! We are as far as F6 this year in the stabilization process. You may not believe this they are 2009. And beautiful and sturdy. Just planted them today. And gave out the others to family telling them I don't know what to expect. Just not red tomatoes. Oh I am excited to see this tomato. I am also growing Copia . Just on a whim. Like I said using up old seed. Being 2009 is almost impossible they came from me originally, as I discovered this line in 2011! So maybe someone named a different variety the same name? Tootaloo, I believe you said these were seeds that had been sent to you? In light of what Iva said, might it be wise, if you know the source, to check the date with the sender, if you have a record of who sent them to you? Sender might also know where they got the seeds?